Great view and quiet, private comfort. We offer the comforts of home in a quiet setting close to the town of Moab, Utah. Our vacation rental offers a comfortable queen size bed, a bath with walk in shower and a separate entrance from our home. We do offer a good cot for a third parson.The kitchen/wet bar area has a Coffee Maker, Toaster Oven and refrigerator. Continental breakfast makings are in the room and the hosts will be happy to assist you in any way. We have a Cairn Terrier and would consider a well behaved dog. The National Parks do not allow dogs. If you plan to visit the Parks we ask that you arrange for doggy day care. We do not allow pets to be left in the room while you are out.Call or email and we will help with this. We also have another room available with private bath. Call or email for details. Fritz and Suzanne hiking in Canyonlands. We love the Moab area and try to hike as often as possible. We have lots of favorite places to share with our guests. We also love to discover rock art and many of our excursions are centered around the search for the ever elusive petroglyph panel. 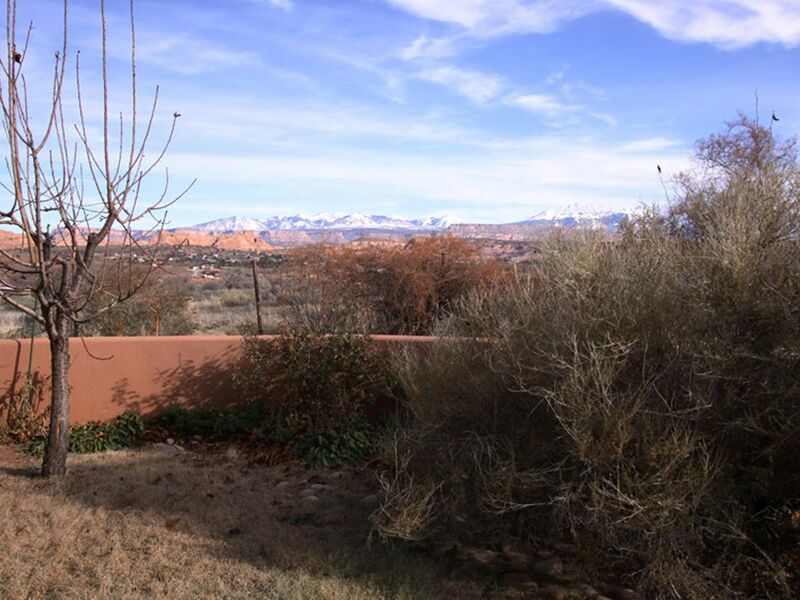 We live and work in Moab and when we built our home we chose this area of Moab because it is very rural, quiet and has beautiful views. We really enjoy our privacy and our studio apartment and second room offer plenty of that plus comfort and a very convenient location. We really enjoy our guests and are happy to provide information about the area and we get interesting information from our guests' discoveries. Oscar the Cairn terrier is always ready with a wagging tail! We have a tiled walk in shower, shelf with room for your personal items and lots of towels. Fine Native American art, pottery and jewelry. Thriving art galleries, great, independent book store specializing in SW literature and guide books. Very helpful visitor center. Although we are only three miles from the center of Moab, we live in a rural neighborhood. Two of the neighbors have horses and we have an enormous garden. We have central air and a ceiling fan. All bedding and linens are provided and we have a good cot for an extra person. Guests are welcome to use our laundry. The refrigerator is under counter. We have a kitchenette..small refrigerator toaster oven and microwave.There is also a coffee maker and tea pot. The studio has a small covered patio with table and chairs and a wonderful view. Our apartment is on a single floor. Our bath may not be large enough to meet ADA standards. Our entrance is gravel. Separate Entrance from Main Home, New Construction Views of Red Rocks and Mountains, Quiet Country Setting, Bath with Shower, All the Comforts of Home. My husband and I recently stayed at this quiet alternative to very busy downtown Moab. The room was clean and comfortable and close to all the area had to offer such as Arches and Canyonlands. A big thank you to owners Fritz and Suzanne for sharing their space. They are a very lovely couple who were always helpful and friendly. I fell in love with how incredibly special of a place Moab is a few years back when going for a mountain biking and hiking trip with my two little doggies. So many great places to explore! Really wish I had found Suzanne and Fritz’s rental sooner!! Interior very well maintained, clean, and shower hot/strong and bed/bedding comfortable. I spent the evenings outside relaxing and enjoying the wonderful views. Suzanne and Fritz have made it a point to make it a wonderful place to stay and are easily available if any questions. Looking forward to going back! Thank you! You all took the weather in stride and were just lovely! Beautiful views. Close proximity to everything. Wonderfully quiet area with beautiful Mountain View. Close to everything. Thank you so much for your lovely review. We are so glad you enjoyed your time with us. This studio is very quiet, and provided us everything we needed to enjoy our stay. Suzanne is very friendly and greeted us upon arrival, and provided an overview of the property. Grateful for this vacation with my beloved dog in Moab. Nice bathroom, comfortable bed and Suzanne and Fritz are very welcoming hosts. The downside was that Wifi didn't work and I was cold during in the evenings. Moab is in the center of the red rock beauty of Southeast Utah. We are minutes away from Arches National Park and Canyonlands National Park and Dead Horse State Park. All are a short drive away. Moab is a recreational Mecca. The Colorado river runs through the north side of town and offers peaceful tours through its many canyons or for the more adventurous wild world class Rapids. Biking, jeeping ,canyoneering and you name it are all centered here. At the end of a long, adventurous day our peaceful, cool covered porch offers amazing sunset views.